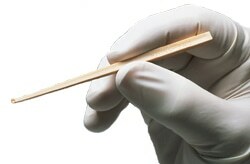 Gently press the cupped tip on mucosal surface and move outwards 2-3 mm. Repeat motion 2-3 times. NOTE: ASI Rhino-Pro® can be bent on an angle for ease of use.